Sometimes a simple decision can change your life forever. I became a vegetarian (and later, vegan) four years ago. Even when it was testing to my mind and my family at times, I have never regretted this decision as it has transformed my life entirely. The diet is more than just an eating habit. Time and time again, it has brought me to the most positive results, and eventually influencing the people around me. Being raised in a traditional Chinese family, we naturally followed a meat-oriented diet. “Roasted Chicken Wings with Potatoes” and “Steamed Crab” were among my favourite dishes. While there has always been an abundance of vegetable dishes in the Chinese cuisine, one could not have easily imagined a meal without meat or seafood with all these delicious flavours and varieties. It wasn’t just about the eating habit too. In any family gatherings, our tables were always “big meat big fish” as we called it. Asian barbecue, hotpot, buffet at the hotels, 90% of these popular places are all filled with meat, and more meat. The more, the better; the heavier, the better. It is how we were simply raised to be. Although I had never detested vegetables or fruits, like everyone else I often thought that the vegetarian diet is only strict and boring. Before it became a trend of itself, there were quite a few traditional Chinese vegetarian restaurants in Hong Kong, but most of them were old-fashioned, with austere decor, unappealing presentation, and perhaps unexciting flavours. None of my friends were vegetarians, not without reasons too. As a vegetarian for 20+ years, Andy Wong (a renowned contemporary dance artist) was the first person who introduced me to a vegetarian lifestyle. His way of living totally changed my perception of vegetarianism. I was inspired to see that even for a dancer who needs a lot of energy everyday, he could still follow a vegetarian diet while being so healthy and physically ready at the same time. He was my first model for being a vegetarian. It was a gift to myself on my 24th Birthday - rather than getting myself a present that I would probably forget in a week, I decided to experience something more meaningful by joining a yoga retreat camp in Tainan. For a week I adhered to a whole new lifestyle - following a strictly vegetarian diet with lots of fresh, nutritious smoothie, juices and food, gradually experiencing a positive change to my body, as well as practicing meditation and mindfulness with guidance. I was surprised to see that my stomach and digestive system had gotten much better, my skin looked clearer and I felt so much lighter physically and mentally. Ever since this marvellous experience, I decided to be a vegetarian. I experienced a serious acne problem all of a sudden last summer. After doing some research online, I decided to give up my favourite dairy products and followed a strict-vegan diet. It was not an easy process, even a painful one - you cannot imagine how hard it is to stay away from so many milk-related ingredients in food like bread, cakes and even soup! The plant-based diet has not only nourished my body, but also transformed the way I see my life. Eating a whole, organic planet-based meal is always more nutritious and fulfilling than any of those harmful processed food. “Less for More” - it is way more than a eating habit. For me this lifestyle applies to every aspects of life, including how I dress, the way I live and even the perception of our relationships with other living beings. Once you decide to consume healthier food, simpler clothes, comforting homewares… Soon you will find out that you are not only living a simple lifestyle with less belongings, but also towards a much wholesome and happier lifestyle. It is “LifeStyle In White”. 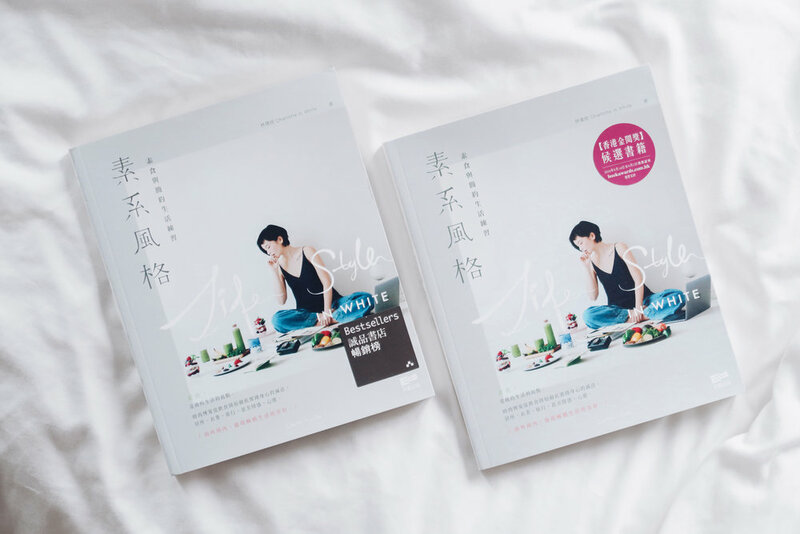 To read more about my vegan journey, my new book 《LifeStyle In White》is now available at all major bookstores in Hong Kong and Taiwan.